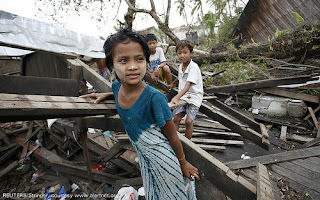 Last weekend, I lamented that the Western media wasn’t reporting the expected fraud activity in the wake of the China earthquake and the Burma (Myanmar) cyclone. Most of the scam activity, associated with the earthquake, was being reported out of China. Having been extremely busy in my day job, I didn’t get the chance to follow-up and see if this trend would continue. It did not and as expected, inboxes are being targeted with come-ons designed to take away from those, who would really benefit from our charitable impulses. As expected, we are now seeing fraudsters, using their favorite technique (spam) to trick people out of their hard-earned money and (possibly) their personal and financial details. The reason, I mention personal and financial details being stolen (identity theft) is because malware is being dropped on systems when unsuspecting people click on a link regarding a plea for financial assistance. Sadly, this more technical means of stealing information is becoming more and more commonplace. Not very intelligent criminals (my opinion) can easily buy all the software necessary to do it — which sometimes comes with technical support — right over the Internet. Of course, identity theft, might not be the only intent in dropping the malware. Frequently, the intent is to take over your system and turn it into a member of a botnet so it can be used as a spam spewing zombie. Most of the time, the owner isn’t aware their computer (zombie) is being used to flood cyberspace with spam e-mails. Internet security firms are reporting suspicious e-mails asking for help and marketable domain names are fetching premium prices. Sophos went on record that they had detected malicious software attached to some of these spam mails. McAfee also reported malware attached to electronic documents referencing the earthquake. The FBI issued an alert on this subject, also. As a discaimer, at first sight, it can be hard to determine if a request for a donation is legitimate or not. Charity is a often practiced social-engineering ploy used by fraudsters and associated internet ghouls to steal money. Besides using the Internet, charity fraudsters also use the telephone, snail mail, or even go door to door. Text messaging is another tool being used to commit charity fraud, also. This surfaced in the activity reported in China last week. The best thing to do — before handing over your hard earned money for an honorable cause — is to make sure the entity receiving it is legitimate. Taking the time to check things out will help ensure the money goes where it is supposed to. It might also be wise to give directly to an organization. Besides fraudsters, a lot of telemarketing types sell their services to charities and take a cut of the action. Simply stated, this means that less money will reach the people you are trying to help. Listed below are some places, where you can cut out the middle-man, or avoid handing over your money to a scam artist. Please note, these organizations, might or might not be involved in the current earthquake and cyclone efforts. Current events often dictate the disaster come-on currently being used by fraudsters. The United Way, http://national.unitedway.org/, 800 272-4630. Habitat for Humanity, http://www.habitat.org/, 800-HABITAT. Samaritanâ€™s Purse, http://www.samaritanspurse.org/, 800 665-2843. Save the Children, http://www.savethechildren.org/, 800 728-3843. Humane Society of America, http://www.hsus.org/, 888 259-5431. Feed the Children, http://www.feedthechildren.org/, 800-525-7575. Americaâ€™s Second Harvest, http://www.secondharvest.org/, 800 771-2303. Mobilizing to provide medical assistance, blankets, water, sleeping mats and tents. Dispatching teams to assess damages and the needs of victims. Assessing immediate needs on the ground and preparing emergency response. On the ground providing emergency relief, including water and tents. On the ground assessing the response effort and responding to victims. Sending emergency staff to distribute aid and make further assessments of the damage. Better Business Bureau Wise Giving Alliance, http://www.bbb.org/charity/. American Institute for Philanthropy, http://www.guidestar.org/. Last, but not least – I would like to provide some resources to report suspected fraud activity. If it is cyber related, report it to the Internet Crime Complaint Center. For more general complaints, fraud can be reported to the Federal Trade Commisssion, here. No user commented in " China earthquake and Burma (Myanmar) cyclone inspire another round of charity fraud! "